Image resolution for new iPhone 6 and 6+, @3x support added? I have looked on few articles and discussion like one here and Here about image resolutions that new iPhones will use @3x images for display. Is it true? So does it mean we will have to keep three images? Say for example I have an image of 50 X 50, will I have to keep 3 images for optimizing the look for new iPhones? Or will the new phones use @2x images only and there is nothing like @3x? I have tested by making a sample project and all simulators seem to use @3x images, this is confusing. Based on Answers given by Tsob and nitin, I added @3x images to my project. Resolution concerns an absolute number of pixels. Density (aka Pixels per inch - PPI) concerns a relative number of pixels per inch which is same in case of iPhone 6 and previous iPhones , but different in iPhone 6 plus. Hence iPhone 6 uses @2x image same as iPhones 4 , 5 and 5S as it has same PPI and iPhone 6 plus uses @3x. I've tried in a sample project to use standard, @2x and @3x images, and the iPhone 6+ simulator uses the @3x image. So it would seem that there are @3x images to be done (if the simulator actually replicates the device's behavior). But the strange thing is that all devices (simulators) seem to use this @3x image when it's on the project structure, iPhone 4S/iPhone 5 too. The lack of communication from Apple on a potential @3x structure, while they ask developers to publish their iOS8 apps is quite confusing, especially when seeing those results on simulator. Support for a New Screen Scale The iPhone 6 Plus uses a new Retina HD display with a screen scale of 3.0. To provide the best possible experience on these devices, include new artwork designed for this screen scale. In Xcode 6, asset catalogs can include images at 1x, 2x, and 3x sizes; simply add the new image assets and iOS will choose the correct assets when running on an iPhone 6 Plus. The image loading behavior in iOS also recognizes an @3x suffix. Still not understanding why all devices seem to load the @3x. Maybe it's because I'm using regular files and not xcassets ? Will try soon. Edit after further testing : Ok it seems that iOS8 has a talk in this. When testing on an iOS 7.1 iPhone 5 simulator, it uses correctly the @2x image. But when launching the same on iOS 8 it uses the @3x on iPhone 5. Not sure if that's a wanted behavior or a mistake/bug in iOS8 GM or simulators in Xcode 6 though. 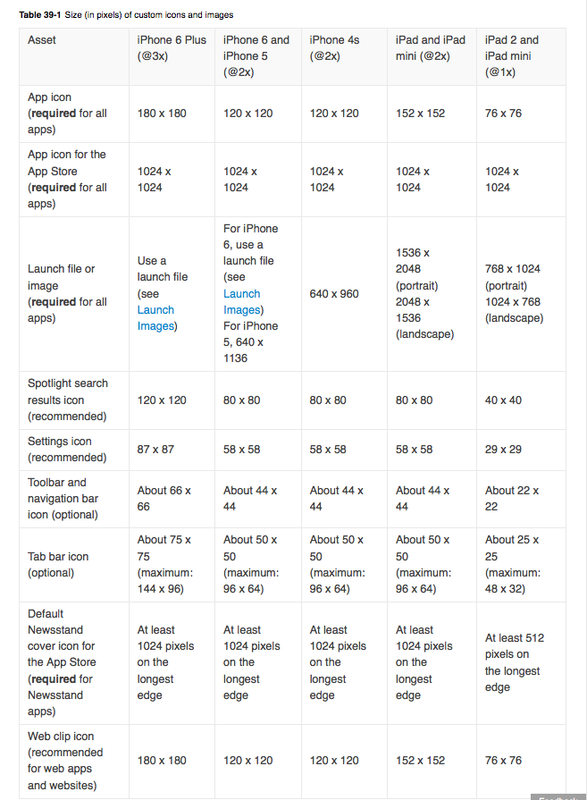 New link for the icons image size by apple. I have tested by making a sample project and all simulators seem to use @3x images , this is confusing. Now run the app on each simulator in turn. You will see that the 3x image is used only on the iPhone 6 Plus. The same thing is true if the images are drawn from the app bundle using their names (e.g. one.png, one@2x.png, and one@3x.png) by calling imageNamed: and assigning into an image view. ios will always tries to take the best image, but will fall back to other options .. so if you only have normal images in the app and it needs @2x images it will use the normal images. if you only put @2x in the project and you open the app on a normal device it will scale the images down to display. if you target ios7 and ios8 devices and want best quality you would need @2x and @3x for phone and normal and @2x for ipad assets, since there is no non retina phone left and no @3x ipad. Not the answer you're looking for? Browse other questions tagged ios resolution iphone-6 iphone-6-plus or ask your own question. Android: what is the difference between resolution and density? For an iPhone only, iOS 7+ app, can we include only @3x images? Why does iPhone 6 use @2x image assets? How do you generate retina (iPad) friendly (progressive or interlaced) jpeg images with CarrierWave? iPhone5 and iPhone 6 images suffix? How is an image being processed to appear in iOS?